Please choose from the categories listed below or scroll down to view all the FAQs. ITS stands for Intelligent Transportation Systems. The ITS Program is a transportation initiative that uses advanced electronic technologies to manage our transportation infrastructure more efficiently to provide motorists with safer, more reliable roadways. ITS is currently comprised of Closed Circuit Television (CCTV) Cameras, Dynamic Message Signs, and Roadway Detectors. These technologies allow traffic managers at the regional Transportation Management Center to operate and manage several interrelated services that are helping improve our existing transportation system, such as the Road Ranger Service Patrol Program, the 511 Traveler Information System and 95 Express. The FDOT District Six ITS Program has installed ITS technologies along the major roadways in Miami-Dade and Monroe Counties. These technologies are comprised of Closed Circuit Television (CCTV) Cameras, Dynamic message Signs (DMS) and Roadway Detectors that are integrated together to manage and improve roadway conditions. These devices communicate back to the TMC through a fiber-optic communication network to help traffic managers at the TMC respond to real-time traffic conditions 24 hours per day, 7 days per week. District Six has a total of 437 ITS devices that cover 213.5 center line miles of managed roadways along Miami-Dade and Monroe Counties. For a complete list of ITS Devices, click here. What are the benefits of ITS? The ITS Program is reducing congestion to provide safer, more reliable roadway travel conditions. By using advanced, cost-efficient technologies to manage traffic, the ITS Program is maximizing the efficiency and overall capacity of our existing roadway systems. It helps in relieving traffic congestion and reducing the need to build or widen additional roadways. The ITS Program also provides our transportation system with several interrelated services that serve a different function, and together are improving the overall mobility of our roadways. These services include,Traffic Management, Incident Management and Traveler Information. What is the District Six SunGuide Transportation Management Center? The District Six SunGuide Transportation Management Center (TMC) is operated by the Florida Department of Transportation to manage the roadways of Miami-Dade and Monroe Counties through the Intelligent Transportation Systems Program. The TMC is a 32,000 square foot facility featuring a multi-screen wall and eight console workstations where operations staff monitor and control Closed-Circuit Television Cameras, Dynamic Message Signs and Roadway Detectors. The SunGuide TMC serves as the physical location in where traffic managers monitor real-time traffic conditions, respond to incidents or crashes and operate ITS-related programs, such as the 95 Express, Road Rangers Service Patrols, and Ramp Signaling Systems. The center also houses the Florida Highway Patrol’s Miami Regional Communications Center and Troop ‘E’ of the Florida Highway Patrol (FHP), the State Technology Office and the Florida Fish and Wildlife Conservation (FWC) Commission have their regional offices at the TMC as well. What is the goal of the District Six SunGuide Transportation Management Center (TMC)? The goal of the District Six SunGuide TMC is to provide safe and reliable roadways for the motorists of Miami-Dade and Monroe Counties. It aims to plan, manage, operate and maintain the District’s ITS Program and the services it provides 24 hours per day, 7 days a week, 365 days per year. The goal is to serve as the region’s traffic management and command center that coordinates with other agencies to formulate the appropriate response to minimize delays and increase safety conditions. Are other agencies located at the District Six SunGuide Transportation Management Center (TMC)? Yes. The Florida Highway Patrol (FHP) Miami Regional Communications Center which includes Troop ‘E’ of the Florida Highway Patrol is housed within the District Six SunGuide Transportation Management Center (TMC). The Florida Fish and Wildlife Conservation (FWC) Commission, the State Technology Office, and the Florida Department of Law Enforcement are also collocated at the SunGuide TMC. Where is the District six SunGuide Transportation Management Center (TMC) located? The SunGuide TMC is located at 1001 NW 111th Avenue, Miami, Florida 33172. How do I obtain traffic speed and volume information for District Six highways? Data requests can and should be made through the District 6 websites via the “Contact Us” page at: www.95express.com for Express Lanes; and, www.sunguide.info for all other roadways. Ramp Signals are an important traffic management technique designed to keep traffic flowing on the highways and help reduce crashes. They are traffic control devices that are located along several entrance points of Interstate 95 (I-95) in Miami-Dade County. They change from red to green lights to regulate the rate at which vehicles enter the highway to reduce the disruptions caused by traffic merging at the entrances. They are serving to improve traffic flow on the mainline and are helping motorists enter the highway safely and more efficiently. Ramp Signals work based on real-time traffic conditions and are typically activated during the weekday rush-hour period to ease congestion during times of heavy expressway use. Why are Ramp Signals being installed along I-95 in Miami-Dade County? With traffic congestion constantly increasing, a sound management of the region’s transportation system is vital to the movement of people and goods throughout the region. The Florida Department of Transportation (FDOT) is activating the Ramp Signaling System as part of the 95 Express project to reduce traffic congestion during the weekday rush-hour period along I-95. The signals have proven to be an effective traffic management technique in several metropolitan areas around the country and are being implemented in South Florida in response to our growing traffic demands. They are a low-cost alternative to traditional widen-only type projects and are providing motorists with real-time benefits along northbound I-95. Where are the signals located? The Ramp Signaling System are activated in two parts and follows the project limits of the 95 Express. Phase 1A of the system was activated in February 2009 along northbound I-95 and is typically operating during the afternoon rush-hour period (4-7pm). Phase 1B was activated in Spring 2010 primarily along the southbound portion of the highway during the morning rush-hour period (6-9 am). How do Ramp Signals located at highway on-ramps improve traffic flow? Generally, many cars try to merge onto the highway all at once. Drivers on the mainline slow down to let the cars enter, and these slower speeds quickly cause backups. If cars enter the highway in a spaced, controlled manner, they merge easier and with less disruption to mainline traffic. A short wait on the ramp allows drivers to increase their average expressway speed and shorten expressway travel times. By regulating the flow of traffic entering the highway during peak traffic hours, the overall flow of traffic on the expressways will be smoother. This regulated flow means we can accommodate more vehicles per hour on the highway, improve commute times and provide a higher degree of safety. Why are some ramp signals operating while others are turned off? Are there different hours? Yes, ramp signals operate at different hours according to real-time traffic conditions. This means that the signals are turned on based on their need to control unregulated ramp traffic from disrupting the mainline, particularly during times of heavy expressway use. Northbound ramp signals are typically turned on during the afternoon rush-hour period and southbound ramp signals will be typically turned on during the morning rush-hour. However, the signals may also be activated during the “off-peak” hours in the case an incident or special traffic event affects regular expressway operations. Do all Ramp Signals operate in the same way? Yes, all ramp signals essentially operate in the same way. However, because of the different entrance point geometrical and operational characteristics, there are some modifications at certain on-ramps to ensure system effectiveness, such as allowing one or two cars to enter the highway per green light. Each on-ramp is clearly marked with specific directions and advanced warning signs with flashing beacons to let drivers know if the ramp signals are turned on. 1. When the signal is red: Pull up to the marked white line on the pavement before the “Stop Here on Red” sign to activate the ramp signal light. 2. When the signal light turns green: One or two vehicles, as indicated by the signage on the ramp, should proceed and merge onto the interstate. 3. Motorists should remain patient. A short wait on the ramp will help reduce travel times and improve the overall commute along the mainline. Why are there different time cycles at Ramp Signals? The red-green cycles varies from ramp to ramp. The green light is typically on for two seconds, and the red light may vary anywhere from two to thirteen seconds depending on the level of congestion on the highway. Ramp signals work according to “real-time” traffic conditions and cycle times will be adjusted to control traffic at that moment. Traffic sensors in the pavement indicate how heavy traffic volumes are on the highway. Lighter volumes will typically speed up the red-green cycle to let more cars enter the expressway. Similarly, if the sensors detect heavier traffic on the highway, the red-green cycles would be adjusted to space out merging traffic. What is the waiting time on the signalized ramps? Waiting times will vary depending upon how many cars are ahead of you on the ramp. In the slowest situation— a thirteen-second red and a two-second green cycle – four cars each minute would be allowed to enter on a specific ramp; in the fastest situation, fifteen cars each minute could enter. For those traveling a good distance on the expressway, the time spent on the ramp is gained back – and more – with faster speeds on the highway itself. Depending on the location and time of day, if someone is only traveling a short distance during the peak period, it might be just as fast to use a local city street. Also, some signalized on-ramps will be used less frequently than others, and the wait may be shorter at those locations. Can Ramp Signals save the commuter time and/or money? Over the years, every ramp signaling project in the United States has been subjected to extensive “before and after” tests. In Miami-Dade County, information gathered by FDOT revealed that Phase 1A of the Ramp Signaling System has increased average travel speeds by 6 mph during the afternoon rush-hour period. This increase in speeds is providing motorists with real-time improvements and is helping them save time and money on their weekday afternoon commute. Increase average travel speeds on the highway. Reduce travel times during the weekday afternoon rush-hour period. Decrease the level of congestion associated with unregulated ramp traffic. Improve merging process for motorists entering the highway. Increase overall safety levels by reducing stop and go traffic along the entrances. Does Ramp Signaling make the expressways safer? Phase 1A of the Ramp Signaling System has not been operating long enough to collect significant crash information. However, studies conducted in other parts of the country have concluded that highway crashes are reduced as a result of the ramp signaling system. The Minnesota Department of Transportation conducted a study of expressway conditions with their ramp signals turned off. All 430 ramp signals in the Minneapolis/St. Paul metro area were turned off for six weeks in the fall of 2000, and the results show a definite safety benefit in favor of ramp signals. With the ramp signals turned off, there was a 26% increase in crashes—rear-end crashes were up by almost 15%, “run off the road” crashes increased by 60%, and sideswipe crashes were up 200%. Research shows that most expressway crashes occur during stop-and-go traffic conditions by inattentive drivers. Ramp signaling provides a smoother flow of traffic, which minimizes this condition. Won’t congestion increase at the locations where Ramp Signals are supposed to improve traffic? 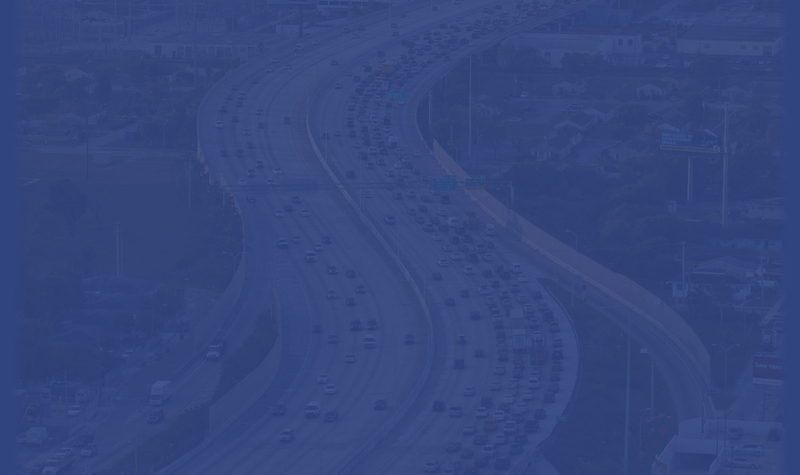 Overall, traffic congestion in metropolitan areas such as Miami-Dade County will continue to grow. However, ramp signals are helping to reduce the type of congestion known as “bottlenecking.” Whenever ramp traffic enters the highway – and then shifts left from lane to lane – it creates a slowing pattern behind that entrance zone and increases congestion. Ramp signals reduce this type of congestion by ensuring that vehicles enter the highway in a spaced and steady manner. They break up the groups of merging vehicles that create disruptions on the mainline and ensure there are enough gaps available for each car to fit. This type of traffic control mechanism manages the overall flow of the highway and helps to reduce congestion on the highway. What about the impact of Ramp Signaling along city streets, doesn’t this program create congestion? No, ramp signals do not create local congestion. Traffic sensors at the beginning of each ramp detect if traffic is backed up onto mainline city streets and alert the ramp signals to speed up the red-green cycle to avoid back-ups. Additionally, FDOT staff housed at Transportation Management Center (TMC) monitors the system visually (via Closed Circuit Television Cameras) and through the information received from the traffic detectors and may adjust cycle times if necessary as well. It is important to note, however, that if local congestion along city streets currently exists, it will not be eliminated by the signals. It is also important to remember that there is often a bit of confusion during the first few days of all signaling projects, which does cause a bit more traffic congestion near the ramps. As drivers become accustomed to the signals and adjust their travel patterns, this temporary congestion disappears. Will ramp signals affect adjacent city streets and increase local congestion? No. There are two ways ramp signals can adversely affect adjacent city streets. The first is backing of ramp traffic onto mainline city streets. FDOT has addressed this by installing end of queue detectors in the ramp signaling system that will send alerts when back-ups are occurring and will speed up the metering rate to avoid back-ups onto the city streets. However, if back-ups currently exist, they will not be eliminated by the signals. It is also important to remember that there is often a bit of confusion during the first few days of all signaling projects, which does cause a bit more traffic congestion near the ramps. As commuters become accustomed to the signals and adjust their travel patterns, this temporary congestion disappears. In cases where traffic continues to back up on the ramp, most problems can be handled by adjusting the signal timing. FDOT will closely monitor each signal as it is brought on-line and make adjustments as needed. The second instance where ramp signals may pose adverse affect is in the diversion of traffic to city streets due to backlog and wait times entering the freeway. This issue has been studied in extensively in their cities where ramp signals were installed show that in those cases where traffic has increased on city streets, the volume has not been significant enough to impact the operation of these streets. Is installing Ramp Signals expensive? No, in terms of return on investment, installing ramp signals is not expensive. The travel time savings provided to motorists as a result of the ramp signals outweigh the cost of installing the system. With Increased fuel costs and concerns about energy usage, isn’t this Program wasteful? No, it is not. Energy and air quality are improved by reducing the stop and go traffic often caused by merging vehicles at the highway entrance points. While vehicles burn some gas waiting on a signalized ramp, the increased travel speeds on the highway makes up for the gas emitted on the ramps. In terms of air quality, environmental experts have concluded that ramp signal program slightly reduces the quantities of nitrous oxide, carbon monoxide, and reactive hydrocarbons – the pollutants in smog. Again, this is a trade–off: while there might not be any measurable differences along the on-ramps themselves, with decreased expressway stop-and-go driving and smoother flow, the overall air quality actually improves. What about the people who violate the traffic signals on the signalized on-ramp? The ramp signals are considered traffic control devices and failure to obey a traffic control device are subject to the same rules of enforcement and fines. In Miami-Dade County the cost of receiving a citation for failure to obey a traffic control device will range from $123 up to $183 or more. The Florida Highway Patrol (FHP) will be responsible for enforcing the ramp signals. The Road Ranger Service Patrols Program provides free incident management and motorist assistance services along the major roadways of Miami-Dade County. They are dispatched by operations staff at the SunGuide Transportation Management Center and work alongside emergency responders to maintain reliable conditions along our regional transportation system. What services do Road Rangers perform? Provide maintenance-of-traffic (MOT) services during incidents. Assist in Incident Management and response. Clear disabled vehicles from travel lanes. Clear debris from travel lanes. Jump-start vehicles and make minor repairs. Provide stranded motorists two free local calls. Monitor abandoned vehicles and notify FHP. Are the services provided by the Road Rangers free? Yes, the services provided by the Road Ranger Service Patrols are free. This includes their their incident management and motorists assistance services. Can a Road Ranger tow my vehicle to a service station? The Road Ranger Service Patrols may only tow vehicles to the nearest FDOT Right of Way. In other words, they can move it out of traffic and off to an area where it can be taken for repair. Which roadways do the Road Rangers patrol? The 511 Traveler Information System is a free service provided by the Florida Department of Transportation (FDOT). It is the statewide service that provides real-time traffic reports through its website or phone system. For more information on how to use the new system, click here. What is travel time messaging? Travel time messaging is a system that will provide motorists with estimated travel time information. Dynamic Message Signs (DMSs) used to provide motorists with information about travel conditions such as lane blockages, will also display travel times. These travel time estimates are based on real-time information provided by detectors that consider actual travel speeds along a corridor. How will travel time messaging tell motorists about travel times? If the travel time from the position of the sign to the location specified on the sign is under 5 minutes, the signs will say “UNDER 5 MIN”. If the travel time from the position of the sign to the location specified on the sign is over 35 minutes, the sign will say “OVER 35 MIN”. If the travel time from the position of the sign to the location specified on the sign is 10 minutes or less, the signs will post the time in a 3 minute range (i.e. 9-11 MIN). If the travel time from the position of the sign to the location specified on the sign is greater than 10 minutes, the signs will post the time in a 5 minute range (i.e. 11– 15 MIN). What are the benefits of having travel time messaging on the roadways? Combined with the traveler information services available through 511, travel time estimates can provide useful information to motorists and assist in route planning and selection. By diverting a small number of drivers away from congested corridors, travel time messages can also assist with the management of congestion. On what roadways will the travel time messaging be available? I-75 southbound (from Griffin Road in Broward County to SR 826/Palmetto Expressway in Miami-Dade County) and I-75 northbound (from north of NW 138 Street in Miami-Dade County to Griffin Road in Broward County). SR 826 (Palmetto Expressway) westbound and eastbound (from Miami Gardens Drive via I-75 to the Golden Glades Interchange in both directions) as well as southbound and northbound (from SR 836/Airport Expressway to I-75). Why are travel time messages limited to these roadways? These are roadways with existing detectors in place that collect traffic data. The Florida Department of Transportation District 6 has completed deploying detectors along the I-95 corridor in Miami-Dade County. When will travel time messages be operational? Testing began on May 13, 2008. The initial phase of travel times messaging became fully operational August 7, 2008. What is the travel time messaging schedule? According to state policy, travel times messages are going to be posted 24 hours a day, 7 days a week, when other more priority levels messages are not displayed. How are travel time messages generated? Traffic data is collected by detectors that are on selected FDOT roadways. The detectors, which are spaced about 1/3 of a mile apart, gather data regarding speed, volume and vehicle occupancy. This data is then analyzed by the Transportation Management Center’s (TMC) software to calculate and post the travel time messages. How often are travel time messages updated? The detector collects data every 20 seconds and the software compiles the data for every minute and then updates the travel time message. Why don’t travel time messages reference segments for farther destinations? There are current deployment limitations leading to some of the travel time message links being short. However, these short travel time links are expected to lengthen with the completion of the deployment projects. How accurate is travel time information? The data collected from the detectors does not have to be perfect to generate useful travel time estimations. Generally, data with 20% error can still provide acceptable travel times estimates. Why are DMSs blank at times? This happens when the DMS is either under maintenance or malfunctioning, or when there are not enough detectors working properly to calculate an accurate travel time. The TMC will continue to monitor these situations and try to maintain a constant flow of travel time messaging. What is the benefit of combining other types of messages with travel times? These message combinations will provide the motorist with a more accurate sense of delay when compared to the existing roadways conditions (normal, incidents, special events and emergency conditions). Will travel time messages be combined with other types of messages? In the future, it is the Department’s intent to combine travel time messages with incident related messages. How is the accuracy of travel time going to be measured? Florida International University (FIU) has evaluated the accuracy of travel time estimations displayed. The evaluation compared travel times at the various corridor locations with ground-thru travel times collected through a floating car study. Overall, 90% of the travel times from the test runs were found to come within their corresponding travel time ranges posted on the DMS. This includes 93% for the first study location (I-75/SR 826) and 87% for the second study location (I-195), or 85% for the morning period and 95% for the afternoon period. Based on the results of the evaluation, the Department has further fine tuned the system in order to achieve a higher degree of accuracy. What future plans are being considered involving travel time information? Travel times messages will be displayed on the 511 website (www.fl511.com) and will be available when motorists call 511.